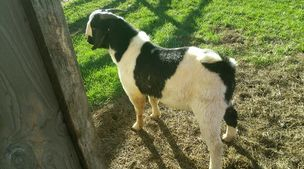 50/50 Boer/Kiko buck born May 2010. He gave us 15 colorful, healthy and quick growing kids for the two seasons he was our herd sire. We still have some of his offspring and other decendants in our herd. Pictured here at 18 months. Pictured here at 10 weeks. 2) Twins (does) born to a lightly painted commercial doe. One solid red and one a black and white paint. 3) Twins (buck and doe) born to a Myotonic doe. 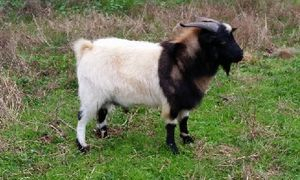 Dark seal (solid) buckling with light dappling and a solid deep red doeling with one white foot. 6) Twins (buck and doe) born to a tradtional doe. Chocolate paint doe and a black headed traditional buckling with heavy spotting on his legs. 7) Single doeling born to a pure white doe. Buckskin paint with black spotting/stripes. 8) Twins (buck and doe) to a heavily colored traditional brown doe. Black paint buck and a traditional black headed doe. 9) Twins (bucks) to a traditional doe. Solid black and traditional black. 10) Twins (bucks) to a red paint doe. Solid black and red paint. We lost our beloved Nitro the fall of 2016 to unknown causes. Pictured here at about 2-1/2 years. Pictured here at about 11 months. 1)traditional set of red headed buck/doe twins. The buckling has spots, a decent size cape and one red leg. Out of paint Boer doe. 2) traditional set of lemon headed buck/doe twins. They both have heavily frosted ears. Out of Boer/Kiko doe. 3) set of buck twins One white and one white with big red spots. Out of a Lamancha/Boer doe. 4) set of doe twins. One golden tan traditional headed and one chocolate traditional headed. Out of Boer/Kiko doe. 5) one set of buck/doe twins. One pure white doeling and a tan headed with dapples buckling. Out of Boer/Kiko doe. 6) set of triplet doelings. One solid dark red, one red paint, one red traditional. Out of Boer doe. 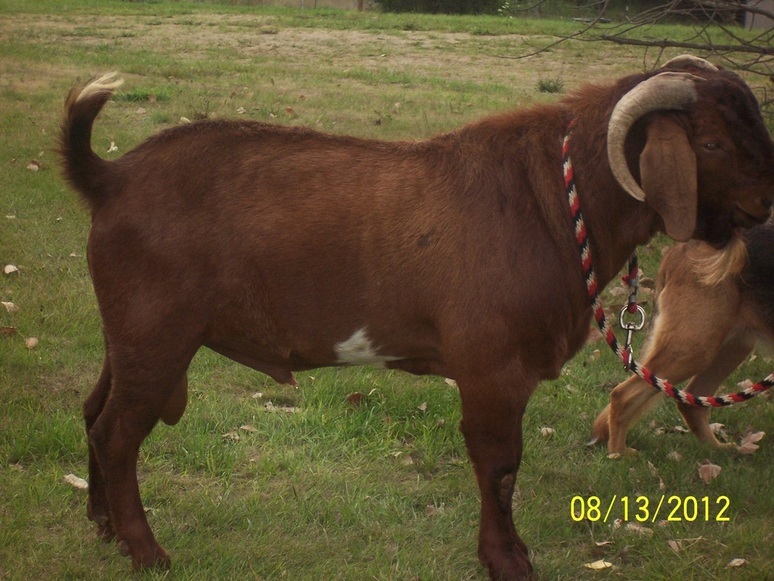 7) set of triplet bucklings. One paint with black spots, and two traditional honey colored headed. 8) set ot twin bucklings. One solid chocolate and one tradtitional chocolate. Kiko/Boer buck. 89% Kiko 11% Boer. A twin born 3/13/12. Grandson of "Prince Ivan of Q farms". My does, Penny and Rosie are also granddaughters of "Prince Ivan of Q farms". I really like this blood-line. Demon left our farm for about a year, but we are happy to welcome him home permanently. Although we had hoped to keep Demon here permanently, he found a wonderful home where he is super spoiled and loved so we are very happy. 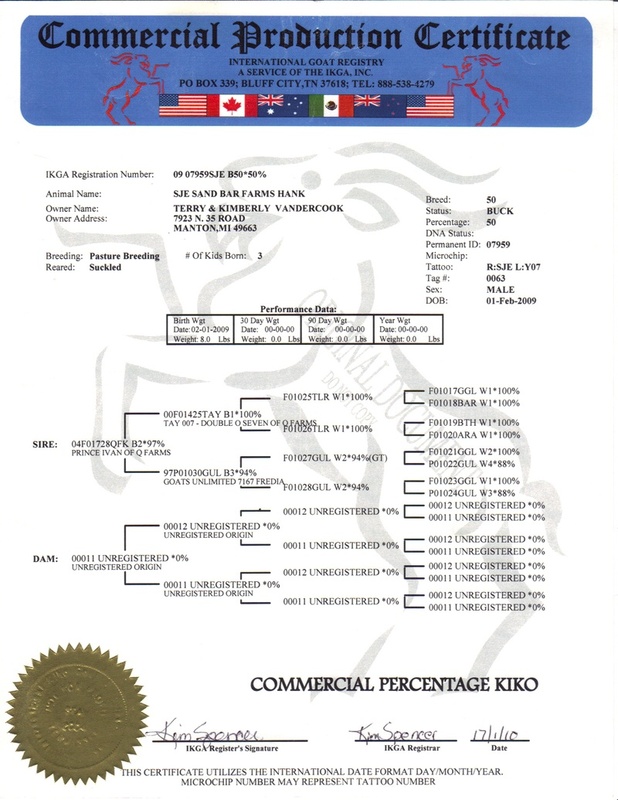 This is for Demon's sire "Hank"